Golf Technology has helped us understand the golf swing immensely, and in this segment of Teaching with Technology, Todd Kolb is back to show us how using this information can help you get fit for the right clubs, and how the Flightscope Shot Optimizer can help you get the most out of your swing. PGA Teaching Professional Todd Kolb with another segment of Teaching with Technology, and today I want to give you a little bit of an inside look—kind of a look behind the curtain—as a golf instructor, or even as a club fitter, the technology and what we have available to us to help you not only hit better golf shots, but get the right golf club in your hands. So as you know, I’m a diehard fan of the Flightscope, it’s something I use on a regular basis. I’ve got my wireless device here, and I’ve hit a couple of shots to give you an example of what we can do to help you maximize distance and accuracy and things like that. So I’m using a feature called the Flightscope Shot Optimizer. Now what does that do? Basically, what it does is as a golf instructor, it helps me look at certain things—or as a club fitter—that I can change that’s going to optimize the distance that the golf ball travels. So a couple things, in this example here, I hit two golf shots. Now my average club head speed was 102 miles an hour. One of those club head speeds, though, was 103.7 miles per hour. So what I can do is I can adjust the smash factor a little bit, up or down, and if I maximize my smash factor—which, once again, is hitting the ball in the center of the club face—I can see how that actually affects how far the golf ball will travel. I can also look at another important key element to maximizing driver distance, and that’s the vertical launch. Is the golf ball launching at the right angle that’s going to optimize the distance? The other thing that’s a big one is backspin; we want high launch, relatively low spin. So spin can be swing related, but it can also be maybe fitting related. Is the club shaft right for you, or do you have the right head and the driver that you’re swinging? When I take those three things, and I can massage them and move them around, I can find the optimum distance that I can hit a golf ball based on my club head speed. 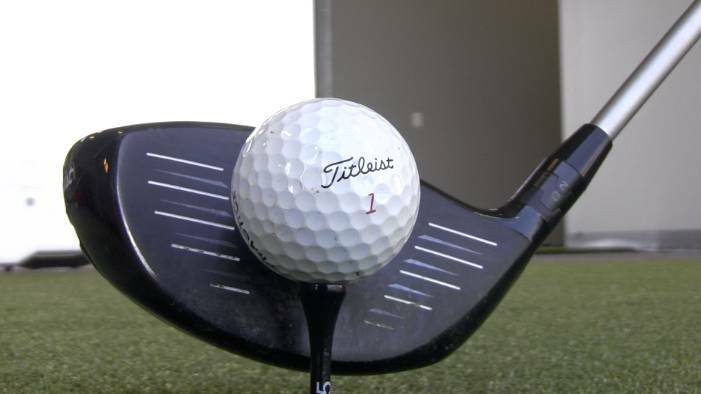 If I hit the ball in the center of the sweet spot, my smash factor; if I get the vertical launch, the angle that the ball comes off the club face correct; and if I can get the backspin right, it tells me exactly how far I can hit the golf ball. So going back to my example, my two golf shots, my average carry distance was 226 yards. But if I optimize it, I can actually carry that ball over 266 yards. If I can get my spin down, I get my club head speed up a little bit, and I get my smash factor dialed in, I can hit the golf ball almost 40 yards further. 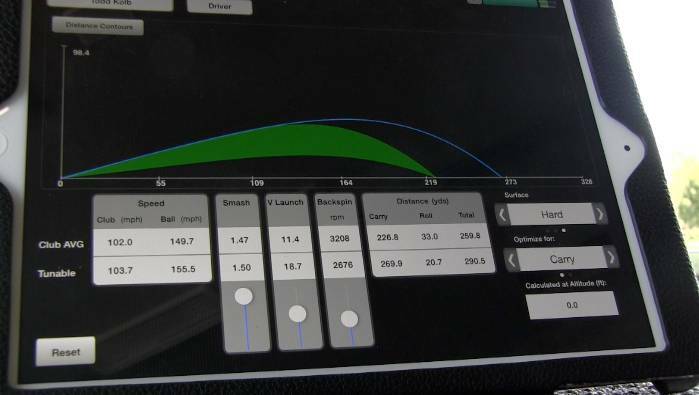 So technology, whether you’re a golf instructor or a club fitter, what the shot optimizer does is it allows us to vary things, change certain things so we can optimize that distance for you as a golfer.